Before having three children, I never realized just how many socks I would be buying for their growing feet. 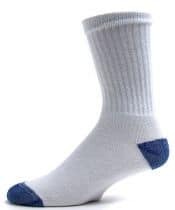 I purchased expensive socks which they would outgrow in just a few months and bargain bin socks which didn’t fit correctly or would fall apart after just a few uses. My husband works on his feet all night and also needs good socks and I have been looking for the perfect sports/exercise socks. Finally, I have found high quality socks for our entire family at Socks4Life which offers prices at up to 85% off retail prices. My husband is very particular about the socks that he wears so I was worried about whether he would try a new brand. I didn’t have to worry because he immediately smiled and said the Heel & Toe Crew Socks had an excellent fit and were very comfortable. I touched base again after two weeks of wear and said that he wanted me to switch to the new crew socks from Socks4Life. When I told him that a pack of 3 pairs of socks was only $7.95 as opposed to his former brand that cost over twice that amount and he was thrilled to find a sock style that he likes better for a fraction of the cost. I like to ride bikes and hike when the weather is nice but I find myself with blisters and sore feet. 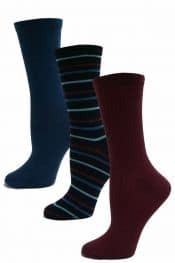 The Women’s Thermal Insulated Socks are perfect……very comfortable under my hiking boots or gym shoes and protect my feet with a heavier cotton/acrylic blend. The Beige with Peach color is feminine too which always adds a nice touch. You get two (not one) pairs of these socks for only $14.95 so I plan to stock up for our summer vacation hiking in the mountains. Another find is the Act Naturally Women’s Bamboo Socks which are extremely soft and durable. I love that these eco-friendly socks are made from renewable bamboo cellulose (40% rayon). It is a “breathable” sock that keeps my feet cool and dry and I really like the fun colors and patterns. These bamboo socks have a nice stretch and hold their shape. The size I selected is the perfect length and it stays put on my calf without rolling down. This set comes with three pairs of socks in different styles for only $12.95. You can head over to Socks4Life to stock up on quality socks for you entire family via their website. I like the preppy Julietta Funky Argyle Knee socks! Voted for you 5/8 on PFB. I’d like to try the Pro-Trek Men’s Heavy Duty Steel Toe Socks.